Today I’m thinking of you. You who are looking at a long road ahead. Maybe you who are staring at a blank wall, wishing that handwriting with clear instructions for the journey would appear. Or maybe you are wishing you could somehow make the wall disappear. I don’t know exactly what your wall or obstacle or hurdle looks like. But my heart hurts for you because not only have I been there, but I sit there with you right now. My sweet girl, Taylor, had a really rough seizure yesterday morning. Today she is very weak and I’m staring at the blank wall of suffering. It’s blank because I just don’t think I can grasp it in totality. Suffering holds no answers. With Taylor’s diagnosis of MPS, I stopped praying for healing long ago, because honestly? I’ve come to grips with the fact that God has not chosen to heal her up to this point. Her medical diagnosis gives zero indication of healing and 100% indication of termination. I’m not saying that he can’t heal her. Or that he won’t. 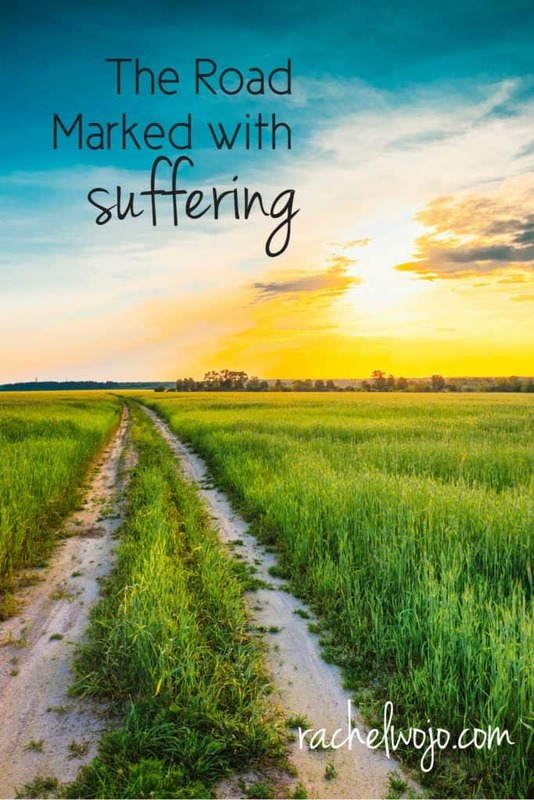 I’ve simply realized that he has marked a certain path for us and as humans, sometimes it looks an awful lot like suffering. Because it is suffering. Oh how we need his mercy, his grace and most of all, his presence. It’s on weeks like this one that I look into her eyes and wonder how tired her body must be of fighting. It’s all she’s ever known from birth. And yet what a fighter she continues to be. She smiles at me and I desperately wish I could take her place. So today I’m praying for grace, mercy and his presence, not only for us, but for you too. May we recognize his presence today and this week. May sorrow allow joy to show off a little brighter. May our hearts remember that even on the very worst of days, our Father has not forgotten us. He longs to hear from our hearts no matter how we are feeling. Because he loves us that much. I wrote a similar message years ago on the blog and a sweet woman sent an email to me saying that she didn’t agree with this thought. That the Bible clearly says “In everything, give thanks.” She failed to give me her thoughts on Jesus’ words on the cross when he begged God to know why he had forsaken him. I don’t think God minds our “why questions.” I think he loves to hear them because they draw us to him. He longs to be close to us. And I’m just so thankful. I need him so much. Especially on the bad days. Because I know you’ll ask…. My new friend, Joy, created the wooden sign above and handpainted the One More Step book quote on it. 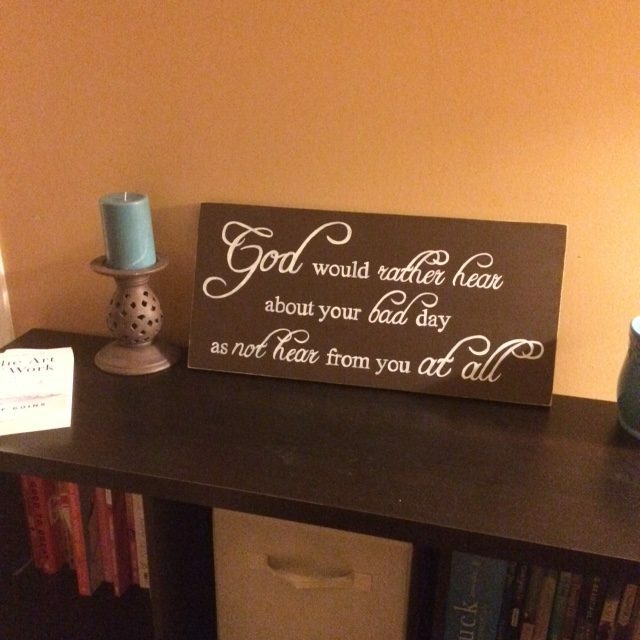 You can visit her shop through 6/20/16 and use the code June15 to save 15% on any order, either a sign like the one above or your own favorite Bible verse or quote. I hope you’ll take advantage of the discount to her beautiful shop. When was the last time you took your bad day to God? Rachel, your such a wonderful mom and a best friend to your daughter. I’ve not gone through anything like this but I admire you for your strength and love you give to each of us, sisters in the Lord. I know you have to be tired but I am sure God has given this issue to show others how to live and others for Taylor who brings another sole into the kingdom because of her courage. I will pray for Taylor and your family. Just know there are many of us who loves you just because of who you are. How did you know that today wasn’t my best day? Five years ago today, my sweet husband of almost 52 years, died of Stage 4 pancreatic cancer. He’d received that diagnosis just three months prior. He never asked, “why me?” He said “why not me?” Those three months were difficult but also the most precious. God wrapped us in His love and He still is holding me. Bad days or good days, God is always there. I wish I had the words to encourage you right now Rachel, as you have so often done for me, but I have been staring at that wall myself today. The only thing that helped a little was to have a shower, give myself a facial and relax. I have been down the road of suffering a long time but I don’t believe this is the life God wants for us. Jesus said in John 10:10 that He came so we can have full life and plenty of joy. Please don’t give up on your daughter’s healing, God is bigger than the impossible and doctor reports – in one passage He reminds us that He made heaven and earth, is anything too hard for Him? What may help now is to have a bubble bath, pamper yourself, and do something just for fun! While you’re having fun & relaxing, God can take care of everything! Sometimes we are just too exhausted to believe in miracles I think. Dear Rachel, I have been on the suffering path for some years. Many things have “gone wrong” and probably not one is as bad as your path with your lovely Taylor. But God never gives us more than we can bear so I think he has spared me a little. I went through a time when I didn’t go to church and mostly just was angry with God. But I never let go of Him so He never let go of me. 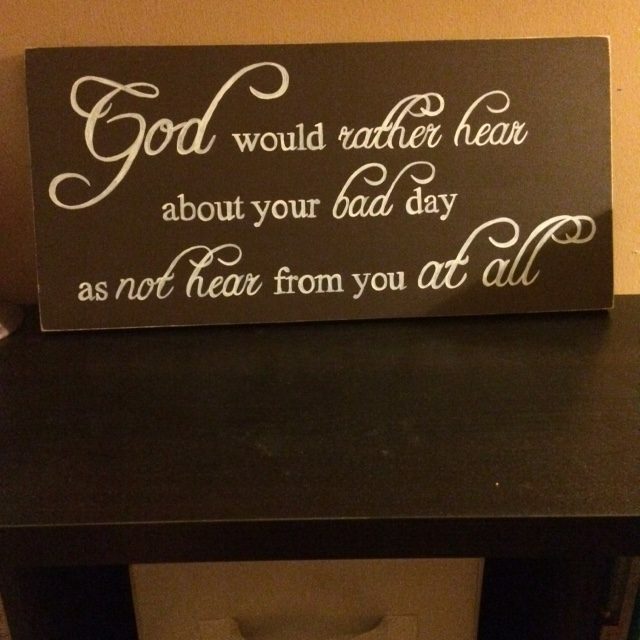 Yes, you’re right he wants to hear from us on our bad days, or weeks, or months or years. Thankyou for your words of encouragement and inspiration. I shall be praying for you and your family. Rachel. I went down the suffering path when my beautiful daughter, my gift from God, decided life was too difficult for her and she took her own life. The pain was so unbearable that I had to be restrained by my closest friends from throwing myself down the deep hole that represented the resting place of her body. At first, I was so angry at God for taking her but I soon turned to him and realized that God had seen what I couldn’t that her place was in heaven and her earthly suffering finally over. He saved my beautiful girl in his wisdom and I began to understand how blessed I had been to be her mom if only for a few years. My anger was forgiven and gratitude remained. My heart is with you; God is good and I offer prayers for you and your precious Tay. Natasha, I am so sorry for your loss! You have incredible faith as does Richel. Jeremy Camp, one of my favorite Christian Praise singers said, of his young bride that passed away, he said….. I asked God to heal her and He did, He called her Home. It is sisters like you, Rachel, and so many others, that inspire the rest of us. God bless you! Thoughts and prays go out to you and your sweet family. Oh, Rachel, my heart is aching for yours and for precious little Taylor…I am praying with you today…thank you SOOO much for sharing and ministering to all of us even in the midst of your own pain. Rachel, As I started my day today with a bit of a negative attitude over trivial things…you again opened my eyes! There is a saying “when you think you have it bad there is always someone who has it worse…. daughter Taylor. May The Lord our God Bless you and your family always.. Thank you so much for your story. It was very encouraging. I, too am going through something very painful emotionally. It’s good to take my focus off myself. I pray for more grace and mercies from God to you and your family. I pray for you and your daughter. Your posts are comforting – I have struggled with fibromyalgia for almost 20 years now. I hate those days I slip back into mourning my old life, but I know God wants to comfort my heart then too. Thank you for reminding us that He sent us the Comforter for the bad times, so of course He wants to hear from us! (When my instinct is to slink off into a corner to cry by myself). God bless! Rachel, what a testimony, witness and example you are to so many of us. God is truly using you, and your family to encourage us, minister to us, and bless us. I went to bed last night after reading your post from yesterday about your beautiful daughters seizure, and you had said you would probably have a hard time getting to sleep. As I lay there on my bed thanking our precious Savior for the day, I prayed a special prayer for you and Taylor, that the Lord would help you sleep. It seems like something simple when it comes easy, but sleep, and especially REST can be something so precious and much desired when it doesn’t come. Everyone has a difficult time that we could share, in fact I could write a book on just the year 2013, it was the worst year of my life, and I contemplated suicide many, many times, and had it not been for my 3 wonderful, amazing sons, I just may have gone through with it, but I had to be here and be strong for them. Thank God He gave me the grace, forgiveness for others, and strength to get through it all. I look back now and know every step I took God was pushing and pulling me along until I could walk on my own, and now I am closer to Him than I have ever been, and I am so very thankful for every trial, betrayal, and abandonment that I went through, because the worst things got, the harder I clung to Him. Had I not gone through it, I don’t think I would have the relationship I have with Him now. ALL things (even the bad) work together for our good….. and I am a living testimony to that promise and verse! So many people are praying for you, and your family, and know (I know you already do…) that God is with you, and thousands if not more prayers are being petitioned to God on your behalf. We love you dearly, pray for you daily. Dear Friend, Rachel, While you are feeling so weak , exhausted and just plain unsure just remember that, “in your weakness God shows strongest”, that “God’s Hand will uphold your right hand” and “He will be the lifter of your head” and that You know Who Holds Tomorrow–God–He is already there. We do not understand God’s ways, nor are our thoughts His thoughts since we can only see in part, we can only see just what is in front of us but God is always in Control. Instead of focusing on the suffering, to focus on my Blessings no matter how insignificant they might seem to others. I am not concerned with what others think but what are the Lessons God is teaching me through my Suffering. To list them down. I have learned that suffering is to build our Character. It shows us who we truly are what areas still need work, it is God’s Loving way of pruning the wayward shoots on our Branch to produce the right kind of Eternal based Fruit that can only be produced by the Holy Spirit as we Abide in Christ. I have also learned that whenever we experience a Victory in our Life Satan attacks us where we are weakest. Wow! God knew I needed to see this. I’m 29 weeks pregnant with our first baby, a precious little girl. 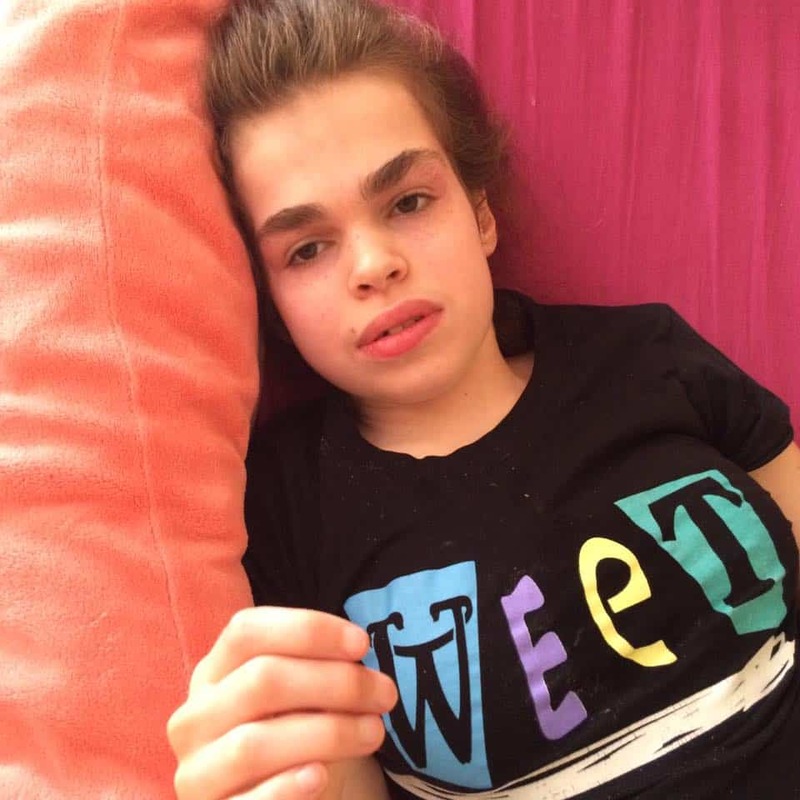 Two months ago the doctors told us that there were some things seriously wrong with her. While the testing for any chromosomal disorders came back negative, we are faced with so many unknowns. The doctors are not sure if she will live past birth. So many people have told me, ‘Just trust God’, and I know they have the best intentions and hearts of love. We are only making it day to day by His grace. But it is so hard to face the days at times with all the uncertainty and fears mingled with the hopes and dreams we are afraid to have. I often don’t even know how to pray, wanting God’s will but also wanting my own way. I have mainly been begging God for grace no matter what the outcome. Your post was a huge blessing to me. oh Cassie! Lifting you up tonight. God sees us, is with us, and loves us more than we can know. I hold to those essentials of faith each day. Much love to you and yours. May the peace of God that surpasses all understanding be with you. I fight every blessed day. As humans i keep on asking God questions. I gave my life to Christ at the age of twelve and keep on asking why all these but i have come to believe that God wants us to trust him even when we don’t understand him. I am also praying with you for grace and mercy. My sister God knows why. He said he will never leave us nor forsake us. We can only trust him to see us through all that we are going through. Thanks so much for being a blessing to me through these bible reading. I am with you and praying for you and Taylor. Be blessed and highly favoured. I have a daughter with epilepsy. She is 43. Every day of her life is different. Works sometimes but can’t hold a job. Has two masters degrees. Life is not fair but nevertheless all life is a blessing. We both have daughter’s who are special blessings that God shares with us. Drawing near to the LORD is the only way to bear well the suffering we’ll experience in this life. Where would we be without Him? Thank you for such precious and heartfelt encouragement! You, my friend, and beautiful Taylor are never far from my thoughts and prayers. Wish we could share a few more hugs.